Food blogger Marc Matsumoto loves cooking paella, a traditional Spanish rice dish, not just because of its simple one-pot preparation, but because of the depth of flavor you don’t see in most rice dishes. You can make it using a nearly infinite combination of meats, seafood and vegetables, but Marc explains his combination selection in a full post on the Fresh Tastes blog. At least thirty minutes before you start your paella, put the chicken in a bowl along with the olive oil, thyme, salt, and black pepper to marinate. When you’re ready to start the paella, preheat your oven to 375 degrees F (190 C). Add the marinated chicken to the pan in a single layer and let it fry undisturbed until it's nice and brown on one side. When it's ready to flip, it should not stick to the pan anymore. Flip the chicken and brown the other side, then transfer the chicken to the bowl with the chorizo. Add the onion, bell pepper and garlic, and sauté until the vegetables are soft and starting to brown. Add the rice, pimentón, saffron, and bay leaf and stir until the rice is well coated in oil. Add the stock, and then return the chicken and chorizo to the pot, stirring to combine. Taste and add salt as needed, but keep in mind that some of the liquid will evaporate so you won’t want to make it too salty. Bring the mixture to a boil, and then turn down the heat to maintain a simmer. Simmer uncovered and without stirring until most of the liquid has been absorbed by the rice (about 10 minutes). 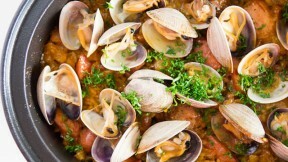 Place the clams on top of the rice and put the whole pot in the oven for 10 minutes. Remove the rice from the oven and cover with a clean dishcloth. Let it rest for 10 minutes. Serve garnished with parsley.